BEIT UMAR, West Bank (AP) — When Mahmoud al-Alami was 9 years old, an Israeli soldier caught him throwing rocks, took him out of his uncle's arms, slung him over his shoulders and carried him away. Mahmoud, now 10, says he was subsequently blindfolded and shackled, slapped and ordered to confess to throwing rocks at Israeli soldiers and identify other children doing the same. Mahmoud is among dozens of Palestinian minors who are detained every month by Israeli security forces in the West Bank and Arab neighborhoods of east Jerusalem, interrogated and pressured to report on others, according to a report issued this week. 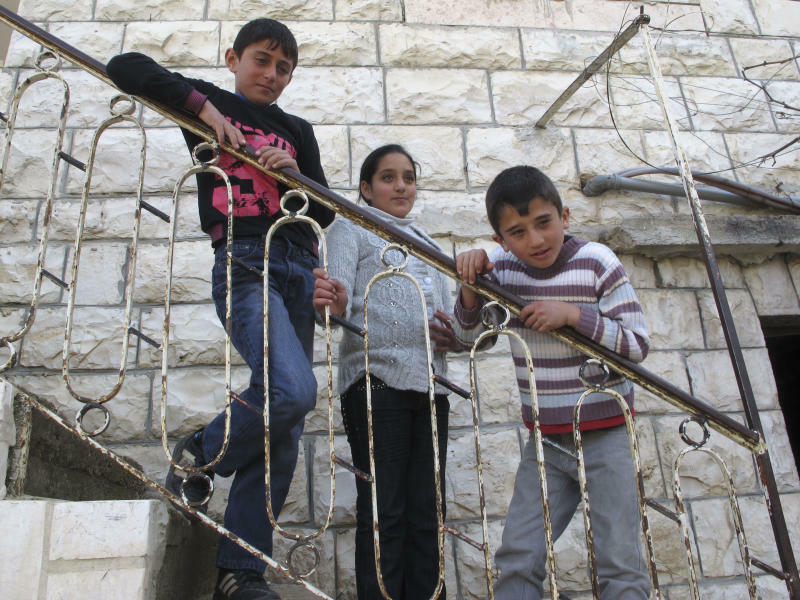 The report, by the Swedish branch of the organization Save the Children and the East Jerusalem YMCA, examined the cases of 297 minors aged 17 and under who were detained in 2011, most of them in nighttime raids on their homes after Israeli forces accused them of throwing stones. The detentions are drawing criticism from human rights groups, which say they traumatize the children and violate their rights. Rights activists say Israel appears to use detentions to scare young children into not throwing rocks again, as well as to extract information about older rock-hurling youths. They say interrogators also gather evidence against Palestinian leaders of weekly demonstrations that take place around the West Bank. The demonstrations often turn into confrontations between rock-throwing youths and Israeli soldiers firing tear gas and rubber bullets. Israel's military points out that rocks Palestinian youths throw can be dangerous and even deadly. In September, an Israeli settler and his year-old son were killed in a car cash after stones were thrown at their vehicle on a highway that crosses the West Bank. "It doesn't matter if it was thrown by a 12-year-old or a 20-year-old if it killed somebody," said an officer in Israel's military justice system, speaking on condition of anonymity under briefing regulations. "We still have to take minors to trial. It's still a serious offense for us." Mahmoud denies he was throwing stones at soldiers when he was detained for several hours in February last year. He says he was hurling rocks at friends pretending to be Israeli soldiers — a game the children call "Arabs and Jews" — near a military watchtower in his home village of Beit Umar. Nearby soldiers thought he was targeting them, he said. "It was just a game," the fifth-grader said. The soldiers chased the children, and Mahmoud ran into the arms of his uncle, who has a mental disability, before soldiers pulled him away. The boy was held from around noon until late evening. His mother says he still has nightmares that the soldiers will return. The Israeli official said the army does not hold children under 12. Asked to explained Mahmoud's detention, he said it's possible the boy was questioned until interrogators found out his age. He said minors are now tried in a special youth court, and that proceedings are sped up. Most minors never make it to trial because they usually agree to plea bargains that their lawyers tell them will reduce their sentences. Few Palestinian youths, or their lawyers, believe they will receive a fair trial. From 2005 through 2010, 834 minors 17 and younger were brought before Israeli military courts on stone-throwing charges, according to the Israeli rights group B'tselem. Of these, 288 — around a third — were between 12 and 15 years old. All but one were found guilty, mostly in plea bargains, and spent a few weeks to a few months in jail. Rights activists say the interrogations of children and use of their confessions are particularly problematic. Confessions from two boys aged 14 and 15 feature heavily in the indictment against Bassem al-Tamimi, a 45-year-old protest leader in the village of Nabi Saleh, who has been designated a "prisoner of conscience" by London-based Amnesty International. Al-Tamimi has been held since March 2011 on charges of inciting youths to throw rocks and organizing demonstrations. Israeli forces taped their interrogation with the boys to use as part of their case against al-Tamimi. One of videos, edited to about 40 minutes from the 5-hour interrogation, was uploaded to YouTube by activists who obtained the footage from defense lawyers. It shows one of the youths, Islam Dar-Ayyoub, then 14, tired and yawning. He wasn't allowed to sleep, eat or go to the toilet, said Israeli activist Jonathan Pollack, who is following the case. In the video, he sometimes cries as two, sometimes three adults pester him with questions. "Why are you crying?" one interrogator asks. "I''m afraid I'll fail at school," he sobs. Later he briefly falls asleep. The Israeli military officer wouldn't comment on the video because al-Tamimi's case is still ongoing. Many detained minors reported being denied sleep, said they were blindfolded, shackled, slapped or bullied into making confessions, according to the report by Save the Children, issued Monday. Most said they weren't told their rights. The report many of the children suffered subsequent trauma, ranging from panic attacks, depression and aggression. The children were held for periods ranging from a few hours to several months, the group said. The military officer said in most cases, lawyers for children did not file complaints about alleged mistreatment and so he could not comment. He said interrogations typically took place right after the youths were arrested to speed up trials. The arrests warp relations in tightknit villages too because children are bullied to confess against their neighbors. Parents fight over whose child squealed on whom, said Fatima Awad, 50, whose son Mohammed was imprisoned for six weeks at age 14 for throwing rocks. Mohammed, who is now 15, said his mother doesn't let him attend demonstrations anymore. "All of us throw stones, it is not one or two children," Mohammed said. "If they take a few kids, will it stop? No. There will be others."